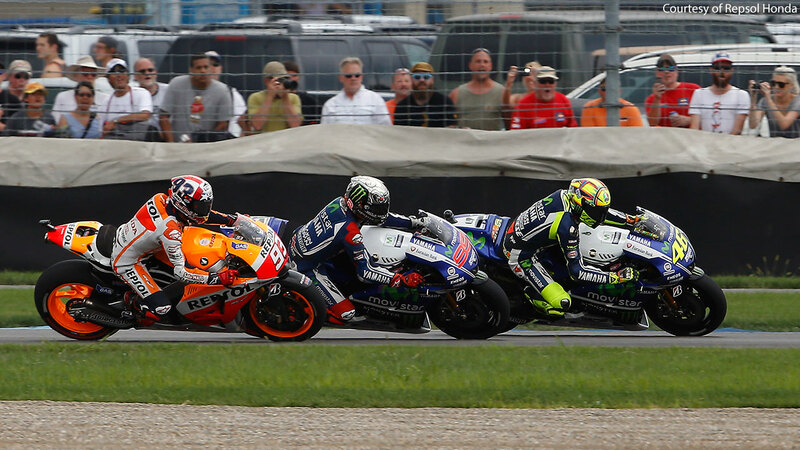 Marc Márquez (no.93) on the Repsol Honda RC213V makes the move on Jorgé Lorenzo (99) and Valentino Rossi (46) on Movistar Yamaha YZR-M1s to take the lead at the 2014 Indianapolis Motorcycle Grand Prix. Lorenzo was on a mission to put an end to Márquez's winning streak, having won nine races in a row. Lorenzo, Marquez, Rossi and Andrea Dovizioso waged a fierce battle for the lead and while Dovizioso kept up during the opening laps, he dropped back during the latter stages to finish in seventh. Márquez scored his tenth win of the season, while Lorenzo, Rossi and Dani Pedroza finished second,third and fourth respectively.